Another month of September and here’s come another version of Visual Concept’s award winning basketball franchise, out now with NBA 2K18. For several years now, Visual Concept has evolved its prized franchise and manages to come back every time with new fresh ideas. Not particularly perfect ideas, some even completely pointless, but we can always be sure of one thing: every new NBA 2K is always impressing me. It’s all generally thanks to its highly technical gameplay, life-like realistic graphics, or the game mode galores; so how can the studio top last year’s edition, considering we gave NBA 2K17 a 9.1/10? For the past four years, Visual Concept has been relying heavily on its career mode, which allows the player to create a virtual player to his own effigy, and discover the life of a basketball players on his professional road in the great American NBA league. The formula has never really stayed the same throughout the years, but the studio is always more ambitious and it feels perfect in NBA 2K18. In this year’s MyCareer, things start in a very classic way: After creating your player (note that the customization options are more limited this time), you start with a series of street basketball matches. DJ, the big mouthed character that will be the voice of your character is no random streetballer, as he dominates the competition and takes the title with his friends, and eventually gets spotted by a Scout of an NBA team (the one chosen by the player as a favorite team at the beginning of the MyCareer mode). This start will not necessarily appeal to all players. Since many would probably have preferred more realism, and why not even a return to the previous NBA 2K17 path: you start with College basketball matches, the NBA draft, and then transition to the league teams when picked. Inevitably, the basketball fan will question realism, especially since NBA 2K has done better in the past. That being, this new approach has its own interesting take on MyCareer, that it dramatically changes the relationship that DJ will then have with the rest of the NBA universe, because as an undrafted rookie, he is not a potential star, and so will become the eternal underdog. This will always provide more motivation to the player who holds the joystick, which will be constantly provoked by his teammates, but also opponent team players, as he works hard to prove himself. NBA 2K18 illustrates rather well the transition between streetball, where DJ shone to where he lands in the NBA. The first matches are of a disconcerting ease, as if the avatar is some sort of reborn Reggie Lewis. Once in the NBA, things are much harder: your player has officially a ranking of 60 and it will have to train hard before reaching peak performances worthy of a true league player. First of all, the question arises as to how an NBA team has been able to offer a contract, even a temporary one, to a guy who can barely make a simple shot. Then because the performance improvement is still dependent on the VC, (in-game currency), is only after many hours of play that you will finally have stats worthy of the NBA players. Some will think that this is a good thing, especially since the NBA is extremely competitive and the simple fact remains that there’s a lot of work to be done to get to a good level. Other players though will probably find it a somewhat vicious way to direct players to the game’s microtransaction system, which allows you to buy large amounts of VC. Plus I’d like to point out that at the silly way the game also handle the player’s energy levels through the season, which degrade after each performance, and has a direct impact on his ability to run faster for example. It’s a logical concept, but in the game, to recharge your batteries, the game invites you to go to a gym, where you can practice in many ways. If this adds a wealth of gameplay features, it also invites whether lazy gamers to spend a few extra real life money to buy Gatorades, sold exactly in the same spot. As a new member of an NBA team, your in-game character will have to show attend numerous training sessions. Forget the “Doin ‘Work” system of NBA 2K17, because NBA 2K18 allows you to go to the training room before each game, where you can participate in up to three exercises. These exercises will allow you to accumulate XP for each of the available Badges, depending on your post and the archetype you have chosen for your player. The system is rather smart but because of the imperatives (maximum score to reach, limited time, etc), it is sometimes difficult to work out specifically some components of his game. We would have appreciated, however, that some basic exercises allow us to improve certain skills, especially shooting at mid-distance, three points, or even free throws. Fortunately, it would be a bit simplistic to limit NBA 2K18 to micro-transactions which, let’s face it, are quite optional. Visual Concept rolled up the sleeves to propose novelty and this time, it’s done with a miniature open world hub called the neighborhood. You will find absolutely everything there: your apartment and private plot, Foot Locker to buy sneakers, NBA official product store, hairdresser, tattoo artist, arenas for ProAm matches, a room to bet on matches… The Neighborhood manages to bring together in a single space all the modes that are linked to your avatar. As a concept, it is damn impressive and the first hours of roaming around the Neighborhood are very pleasant, but the fun is short-lived, especially for those who would like to just play official matches, and possibly live through the story mode created by the developers. Crossing the streets of NBA 2K18’s Neighborhood is long and laborious; there is no shortcut, except the one allowing instant access to the NBA matches. To give you some ideas, if you want to talk to your agent, you will have to walk to his home which can take you up to 3 minutes. Buy a new pair of basketball? Walk to the shop! Even to get out of the house, you will have to physically go to the door. We understand the willingness of developers to come up with something more realistic, but a little more flexibility would’ve not hurt on that front. Ultimately, if the proposed result is rather impressive, it will not appeal to everyone, and could be considered as an added gimmick. Other than the changes listed above, Visual Concept took the opportunity to review their game mechanics and give us more realistic sensations on the court, if that’s even possible given how lifelike everything was already. The physics engine of the game has been improved and this is noticed especially on the player animations, which are much less calculated than in the past. This is particularly noticeable on steals, jumps or rebounds, and depending on the point of contact, the hit applied to the basket, the bodies twist, pivot and ultimately give a very pleasant feeling of fluidity, instead of being just a formed cluster of pixels. Controlling the players is therefore very pleasant, and visually, the sensation of realism is striking. It is now possible to make a pass while jumping, without going through the “fake jumpshot + pass” combo which had its limits; a longer and more accurate pass can be made by holding down the A key and then quickly selecting the desired player. The power gauge is now displayed at the player’s hands, and provides greater clarity on the difficulty of shooting and the intensity of the opposing defense. Everything in this NBA 2K18 gives the impression of being more natural and obvious. Especially when it comes to attacking, because in previous episodes, it could be annoying to see how some players, even the smallest, could stop a monster such as LeBron James, but thankfully in NBA 2K18, the biggest dunk masters are truly powerful beasts! Besides the MyCareer mode, NBA 2K18 launch with a plethora of game modes that are all rich in content. We talked about Career and Pro AM, which largely benefit from a new system of player archetypes, but we could also spend a moment talking about the MyTeam mode, which is the equivalent to NBA 2K of the FIFA Ultimate Team, or even MyGM, which allows you to play as the General Manager of an NBA team of your choice. It is the latter that has changed the most this year, since Visual Concept has decided to endow it with a small story mode scenario, which to my regret, was not a good idea. After several tries, I quickly realized that the scenario was exactly the same from one team to another. Barely named General Manager, you meet the owner of the team, a man obviously a bit obnoxious with a lot of investments done over the years. As the season progresses, we learn via social networks that the owner has “lost” an enormous amount of money, which leads to the same conclusion: the man is forced to sell his team, and the new owner, friendly as he is, wishes to move the franchise to Seattle. This evolution may be appropriate for your party if you have chosen a team like the Kings, which has been in turmoil for years, but it is much less credible when we talk about teams like the Lakers, Knicks or other franchise attached to the cities they represent. Disregarding this added – pointless – story mode to MyGM, it is still safe to say that this mode hasn’t lost its depth. The possibilities are still numerous, especially since this year the game allows to sign “two-ways contracts”, or to benefit from the Hardship Exception, in case of many injuries in the team. On the trade side, the whole is rather coherent, even if we continue to see quirks, such as the Spurs able to propose Tony Parker in exchange for a random rookie like Brook Lopez early in the season. Overall, the game regularly overlooks the small specificities of some players, or some teams, which is a weird thing for a game that is proud of its realism. Last year, despite its many qualities, NBA 2K17 annoyed me because of absurd little bugs. Things have improved this year, and I’m happy to say those random issues are fixed, like faces not loading properly on players, and more. The online part of the game also offers a much nicer experience and during my test, there’s been barely any lag, even with my humble connection. However, difficult not to be impatient in front of too many loading times that seem to have multiplied, and present almost everywhere now, even when opening your smartphone. It breaks the mood and pace of the game, especially in Career mode, which is already wasting a lot of time with its endless displacements in the Neighborhood. So what about the “lesser” of all versions? Would the Nintendo Switch be able to display a realistic basketball court, swept with dynamic light effects, bludgeoned by the shoes of a dozen very detailed characters, in the midst of a lively audience? Well my experience was more mind-blowing than a three-point buzzer beater! Locked at 30 frames per second, the framerate is certainly lower than other consoles but has the merit of never dropping no matter the circumstance. I haven’t seen a single slowdown in any mode of the game, which makes it possible to never miss a decisive pass or a shot for a reason other than your own skills at playing the title. Of course, some compromises were made on the front of lighting and shadow effects, and there’s some strangely pixelated borders on some part like the skirt of the American national anthem singer. Nothing serious however, and NBA 2K18 looks great in docking mode, realistic enough to ensure immersion, and in tablet mode, it has a remarkable precision. Clearly, NBA 2K18 could mark a turning point for the Nintendo Switch, and encourage other third-party publishers to tailor their most demanding blockbusters to support. On the other hand, all this has a cost: the game will require around 23 GB on your micro-SD card, so better cough up some cash on extra storage for your Nintendo Switch before grabbing this title. Besides all this, NBA 2K18 is still the greatest sport simulation in the market. I might be a bit too harsh on some points, but this is expected from a game that seeks perfection on all fronts. At least from a purely technical point of view, the game is still a high-end graphical feat, with textures always finer and more precise, especially regarding the skin of players and their small imperfections. Small other details lack in details, like the coaches, the face of the national anthem singer, and the trio of Shaq, Ernie and Kenny is still not very expressive, despite an excellent dubbing. • Where did the Euroleague teams go? 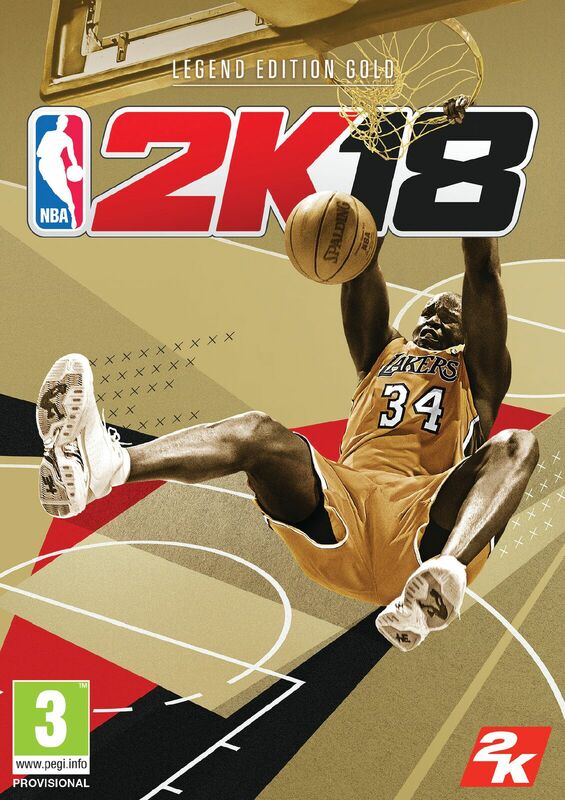 It's no surprise that this year as well, NBA 2K18 is a very strong entry in the franchise. If the developers bet very much on the Neighborhood, it seemed quite uninteresting and even rather painful to use, but at least the strength of NBA 2K18, as every year, is in the precision of its gameplay, and the richness of its game modes. A must for fans of the NBA and basketball.